The incident occurred on a Thane bound train from Chhatrapati Shivaji Maharaj Terminus station, in the compartment alloted for differently-abled passengers. Rafiq Khan goes on to drag the victim by her hair and then tries to strangle her. Mumbai: The Mumbai police today arrested a man for molesting and trying to strangle a women on a local train late last night. The incident occurred on a Thane bound train from Chhatrapati Shivaji Maharaj Terminus station, in the compartment allotted for differently-abled passengers. 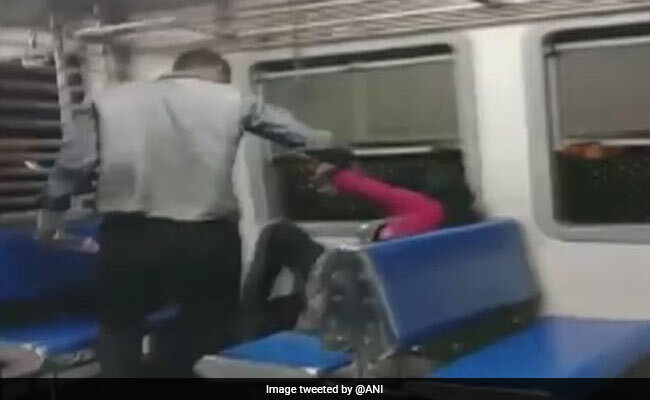 A video shot by one of the commuters, which has gone viral on social media, shows the man dragging the woman by her hair and then attempting to strangle her. The accused identified as Rafiq Khan, was a cab driver from Byculla who had known the victim. He owed her money over which both of them had an altercation. In the video, Rafiq Khan is seen sitting on the opposite side of the seat and is suddenly pouncing on her. He goes on to drag her by her hair and then tries to strangle her. The woman is seen fighting him back in the video. Later, the accused went on to tearing the victim's clothes off even as other commuters tried to raise an alarm to alert police. Dadar Senior Inspector Nitin Bobde said that "the woman had lent money to her attacker on a friendly basis as she had known him over a few years." Khan was taken into custody by the GRP police team from Dadar after he deboarded. The victim registered a complaint after which he was arrested early on Friday.